The Romanian government has officially requested UNESCO to withdraw Bucharest’s application to make Rosia Montana a protected world heritage site. The move prompted outrage and protests over the ruling PSD’s apparent links with the company that wants to turn the site into a commercial gold mine, writes Claudia Ciobanu. Claudia Ciobanu is a Warsaw-based freelance reporter covering Central and Eastern Europe. Prime Ministers in Romania change, but the song remains the same. Last August, I wrote that the move to withdraw the application was being prepared by the then PM Mihai Tudose. The Social Democratic (PSD) government sent the official withdrawal notice shortly after the International Council on Monuments and Sites (ICOMOS) recommended the inclusion of Rosia Montana, a historical mining settlement in western Romania, on the UNESCO list of protected sites. A decision on the file – likely positive — was imminent. Romanians responded with outrage. A petition directed at UNESCO – which apparently is still able to reject the government’s request – gathered 6,000 signatures in the first few hours after launching and there will be protests in Bucharest and Cluj on Friday. Observers of the Rosia Montana case said it was likely that the government would withdraw the application. The UNESCO file was submitted by the technocrat government of former European Commissioner Dacian Ciolos in the final hours of its mandate in early 2017. The step was taken after enormous pressure from civil society: everyone knew that only Ciolos’s team could submit that file and that the PSD, which was coming to power, would try to block the process. Ciolos’ culture minister Corina Suteu was the first politician to have enough will to push through with the idea. The UNESCO listing is the only way to guarantee the protection of Rosia Montana. The PSD government says it is withdrawing the application because of risks connected to an ongoing arbitration case between Romania and Gabriel Resources, a Canadian-listed company which wants to build a mine in Rosia Montana. In 2015, Gabriel Resources sued Romania in front of the World Bank International Center for Settlement of Investment Disputes (ICSID), a commercial arbitration court, for not being allowed to go ahead with its plans to build Europe’s largest surface gold mine in Rosia Montana. In 2016, Gabriel confirmed it was demanding $4.4 billion in damages, a huge sum for one of the poorer EU countries. The company (and its various predecessors) have been trying to begin mining in Rosia Montana for over a decade, but their permits were repeatedly thrown out by Romanian courts. In 2013, a previous Social Democratic government tried to pass a law that would have allowed the company to go ahead with mining regardless of the court decisions. Massive protests ensued in Bucharest and many other cities and villages, causing the government to drop the draft law and, consequently, cancel the project. Gabriel Resources then sued for damages at the arbitration court. Defenders of Rosia Montana have long-feared that a PSD government might be ready to strike a deal with Gabriel Resources to end the arbitration case. Several high-ranking PSD members are thought to have close links with the company: the current Mayor of Bucharest, Gabriela Firea, once posed in clothes bearing the mining company logo, while the firm of former minister Vasile Dancu prepared opinion polls that benefited the company but were later proven to be controversial. 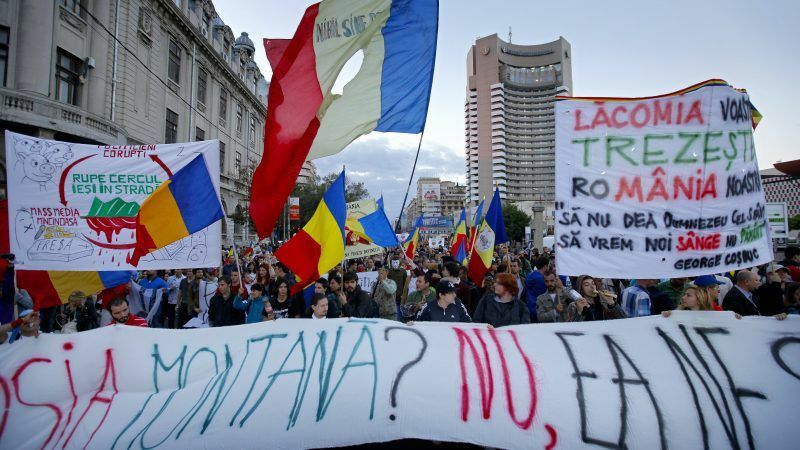 There has never been an official investigation into the Rosia Montana affair but many Romanians are convinced that corruption is the reason why the mining project was never challenged by anyone in power before 2013. Striking a deal at the arbitration court would mean information that could otherwise be made public during the trial would be kept secret forever. Withdrawing the UNESCO application would certainly signal to Gabriel the Romanian government’s ‘good will’ towards brokering a settlement. The masks have fallen.